NATO’s commander in chief says the West should not rule out arming Ukraine. 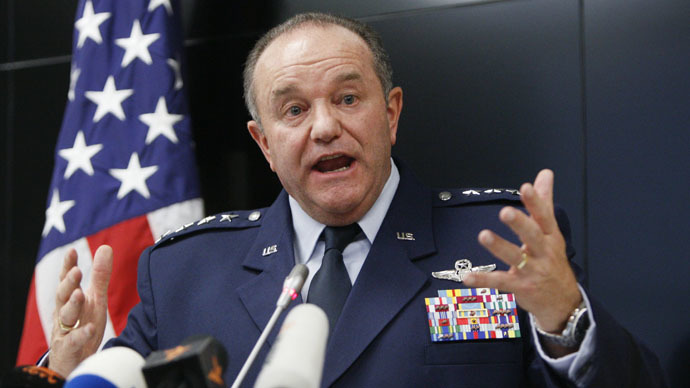 General Philip Breedlove said no troops would be sent to the region, but providing Kiev with weapons and equipment was on the cards. His strong comments come as the US is considering sending weapons to help Kiev in its fight against anti-government militias. Russian Foreign Minister Sergey Lavrov is expected to meet US Secretary of State John Kerry in Munich and NATO Secretary General Jens Stoltenberg, while US Vice-President Joe Biden is also due to give a speech. NATO Secretary General Jens Stoltenberg has already said the organization’s Response Force in Europe may increase to 30,000 troops - more than double the current 13,000 - with the majority to be posted near Russia’s borders. However, there are reports that NATO and the US have been arming the Kiev forces. Russia’s ambassador to the organization, Aleksandr Grushko, says “there is a bulk of evidence that Western-made arms are being used in Ukraine,” mentioning lethal munitions such as NATO standard artillery shells. He has asked the Organization for Security and Cooperation in Europe (OSCE) to investigate the claims. Moscow has urged Washington not to send weapons to Ukraine, which could include military hardware currently being pulled out of Afghanistan. The White House admitted on February 5 that arming Kiev could increase bloodshed in the region. “They are telling us in NATO they aren’t supplying anything, that lethal weapons are not supplied [to Ukraine] … that NATO has no [standard] arms and all weapons are national and there are no NATO systems as such. In reality, this is not true,” Grushko said. Ukrainian President Petro Poroshenko has asked the West to provide his country with weapons on numerous occasions. US President Barack Obama is expected to make his decision on the possibility of sending lethal aid to Ukraine next week, Secretary of State John Kerry announced during a visit to Kiev. The secretary of state says Obama’s choice will be based on his [Kerry’s] comments and recommendations following his visit to the country, and will also take into account Angela Merkel’s visit to Ukraine. The question of supplying Kiev with weapons seems to have split the EU-US alliance. France, Germany and Britain amongst others have already ruled out sending lethal aid to Ukraine, but the Baltic States and Poland are keen on the idea. “More weapons in this area will not bring us closer to a solution, and will not end the suffering of the population,” German Defense Minister Ursula von der Leyen told reporters in Brussels. German Chancellor Angela Merkel and French President Francois Hollande flew to Moscow on Friday for talks with President Putin to try and broker a peace deal in Ukraine. The arrival of the two heads of state, without consulting John Kerry, is seen as a sign that Europe is nervous about the prospect of arming Ukraine. The French publication, Le Nouvel Observateur, hinted the decision to visit Moscow came as an attempt to present a viewpoint on solving the Ukrainian crisis that differs from the US one. “I think the US is concerned that Europe can take an independent path away from the Unites States, in other words away from the NATO alliance in defense of their own national interests,” Brian Becker, director of the Anti-War Answer Coalition, told RT.